Welcome to Clay and Limestone's December's Roundup! Wildflower Wednesday is about sharing wildflowers no matter where you garden~the UK, tropical Florida, Europe, Australia, Africa, South America, India or the coldest reaches of Canada. It doesn't matter if we sometimes show the same plants, how they grow and thrive in your garden is what matters most. I hope you join the celebration...It's always the fourth Wednesday of the month! Without further ado, here are the best and brightest of Clay and Limestone's 2013 wildflowers. I am singing my happy song and dancing my happy dance. After years of searching for this rare shrub that is endemic to a few counties in Alabama, one county in Middle Tennessee (Coffee) and three counties in faraway Texas (Croton alabamensis var. texensis/Texabama croton). I now have one of my very own. Alabama Croton is a semi-evergreen, thicket forming shrub which can easily grow between six to ten feet tall and forms a lose rounded shaped shrub at maturity. It produces very few leaves, but, the ones it has are noted for their oval-shape and glistening silver scales and stunning autumn color. In milder winters the leaves hang on and flutter green and orange until spring. Alabama Croton is the bees knees. It's not deterred by dry, poor, limey soil, easily braves hot summers like we've been having the past few years, will grow in decent garden soil that is well draining, grows in the full sun, but, can appreciate a semi-shady location, is native to Middle Tennessee, is locally sourced, and it has year round interest. It is a tiny member of the Carrot (Apiaceae) family, growing from a round tuber and I count myself fortunate when it showed up in my garden a few years back. I dearly wish it were commercially available~it's a lovely little flower and should be in more of our woodland gardens and there should be more in my garden! Of the four toothworts found in Tennessee, the cutleaf toothwort is the happiest in my garden. It has formed small colonies and usually begins blooming in late February here in my Zone 7 garden, elsewhere in it's native range (Eastern US and parts of southern Canada) it might not appear until April. It prefers moist forested woodlands with lots of decaying leaves and dappled sunlight. It plays well with other spring ephemerals and quietly disappears by early summer leaving space for summer blooming plants to do their thing. Long time readers already know about her charms...PPPP has an exceptionally long bloom time (six weeks or longer), fantastic pink flowers, grows in sun and part sun, tolerates clay soil that's wet all winter and dry all summer, has a marvelous ground covering effect, and has the sweetest fragrance that wafts all over the garden on warm days. A plant like that is practically perfect! It's found naturally growing in open woodlands, meadows, prairie remnants and limestone glades through out the eastern US and Canada. Seriously, you must have this plant in your garden! I love this plant and want it to step out of the shadows of the woodlands and from the corners of old gardens into the spotlight. Even if you haven't the space in your garden for a shrub this large, you can spread the word and encourage native plant enthusiasts to think about adding Scentless Mock-Orange to their gardens. It's a wonderful shrub for the back of the border, at the edge of the woods, as a good basic hedge/screen, a specimen in a large border or in a cottage garden. Scentless Mock-Orange has clusters of small flowers with a marvelous amount (60 to 90) stamens in each flower. The entire plant can reach a height of 10'. The mature bark is often gray, but can become more of a mahogany color over time. It is more floriferous in full sun, but grows well in part shade with at least four hours of sun. It prefers calcareous or neutral soils (my garden) and can be found in nature from Canada to Florida and weest to Missouri, Arkansas and Louisiana. (source) It's a beautiful flowering shrub that's not only easy to grow, but, takes very little maintenance....I never water it. Trust me here, it has survived in the Garden of Benign Neglect for almost 30 years. Elymus hystrix is a graceful ornamental grass that I only noticed about six years ago. It just appeared in my garden, a gift on the wind and I have loved it ever since. It's hard not to appreciate any plant, especially a grass that actually prefers the shade and is tolerant of dry soil. While other ornamental native grasses are barely showing life, cool season Bottlebrush Grass is green and beginning to sway in the garden. It's a grass with medium green coloring and an interesting loose structure. It's not at all like Panicums or River Oats that command a lot of space in your garden, in fact, I find the loose structure makes it a perfect grass to fit into a smaller space....perfect for jam packed gardens. Blue mist flower is a tall, graceful, eastern North American native wildflower that begins blooming in late August (Middle South) and continues through early fall. The lilac-blue flowers add a softness to late summer and fall gardens when rough and tumble flowers like the Susans, Goldenrods, Cup Plant, Verbesinas, Joe-Pye weeds and Ironweeds are making a large and loud scene. It's especially beautiful when allowed to naturalize and make its own big statement. There's the rub, you have to be willing to let this plant do its thing to get the big effect of it's lovely misty presence. That means living with the rough, but not unattractive leaves until the summer wains and the blooming begins. 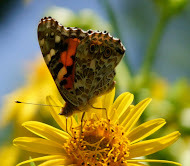 Butterflies and bees are drawn to the nectar-rich flowers, while birds eat the seeds. If you want more, and once you see it massed you will, it's easily propagated from seeds, cuttings, rootball divisions or layering. It thrives best in a well-drained acidic to neutral soils in a sunny environment. If you want easy care this is a great wildflower, but, it does naturalize easily, spreading by rhizome and seed (and is pulled out just as easily). Mother Nature designed False Dragonhead with bumblebees in mind. The tubular flowers are perfect for plump little bee bodies to slip right in to find the sweet spots of nectar and while pollinating the flowers. Although, Bumbles are the primary pollinators of False Dragonhead, it's visited by many other pollinators. Swallowtail Butterflies and Silver spotted skippers with long proboscis can reach far into the corolla for nectar and Carpenter bees, although, much too large to fit into the corolla, cleverly drill directly into the flower side to get at the nectar. It's a clump-forming North American native perennial that is found in fields, prairies, thickets, woodland openings and borders, along rivers and streams and lake sides in much of the eastern and central United States, as well as eastern Canada. In other words, it prefers a moist spot in full sun or part shade! This member of the mint family typically grows 2-4' tall on stiff, square stems and features spikes of pinkish, tubular, lipped, snapdragon-like flowers which bloom in my garden during September and early October, just in time for late arriving pollinators which are making a mad dash to collect as much nectar and pollen for their last brood. Carolina Climbing Aster has sweet honey scented pink lilac flowers that bloom in late fall~October in my garden and November in warmer climates. Each flower is about one inch wide, and like other composite members of the Asteraceae family, each of the flowers has many tiny disk and ray flowers that make nectar and pollen for late visiting pollinators. Pretty flower faced Climbing Aster is a wonderful addition to a pollinator garden with its sweet honey scent, late season nectar and pollen source and most delightful of all, it's a host plant for the American Painted Lady butterfly caterpillar. What makes this aster especially unique is that it's the only woody perennial scandent (climbing) aster in North America. Merry Christmas and thank you all for a marvelous year of wildflower celebrations! 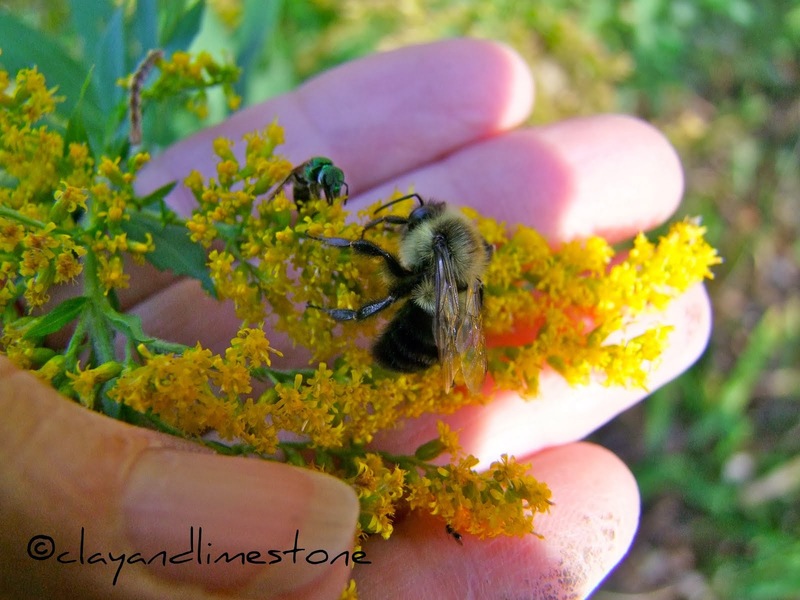 Your enthusiasm and support make it all the more fun to indulge in one of my favorite past times~talking and sharing information about wildflowers! See you January 22, 2014 when it's once more time time to get our wildflower on. Wonderful! I always enjoy your blog. Looking forward to more in 2014! Happy Christmas! A great round-up. Lots of inspiration here for the coming year. I hope you and yours are having a Merry Christmas. Merry Christmas. I love the Roundup - and appreciate the whole idea of wildflowers on Wednesdays. It was nice to see these wonderful plants again Gail.....you already bring me so many ideas for new plants in my gardens...here's to learning about more in 2014...happy New Year! Hi Gail, I enjoyed your year in review. It's fun seeing plants we have in common, and some that we don't. I forgot about WW, but did a post today, so I decided to go ahead and link in. Great roundup, Gail! I hope to join in in January. I've learned so much from your blog this year, and always look forward to your posts! I always enjoy your year-end roundup of wildflowers, Gail; it's a good reminder of some of the new plants you introduced us to during the year that I might have forgotten about. And your photos are beautiful--who wouldn't want to plant some of these natives after seeing them here?! I haven't had time to participate the past two months, but I hope to be back in January. So many of the new natives I planted in my butterfly garden didn't bloom this year; I'm hoping they survived and will bloom this year. But one of the happiest events in my native garden this year was seeing the PPPP multiply and pop up in other places--hooray! What a lovely way to end the garden year! I think you should have taught our wildflower session during my Master Gardener training. You and I have many of the same plants. I love the textured leaves of blue mist flower. It's really pretty grown with the white flowered form, as well. 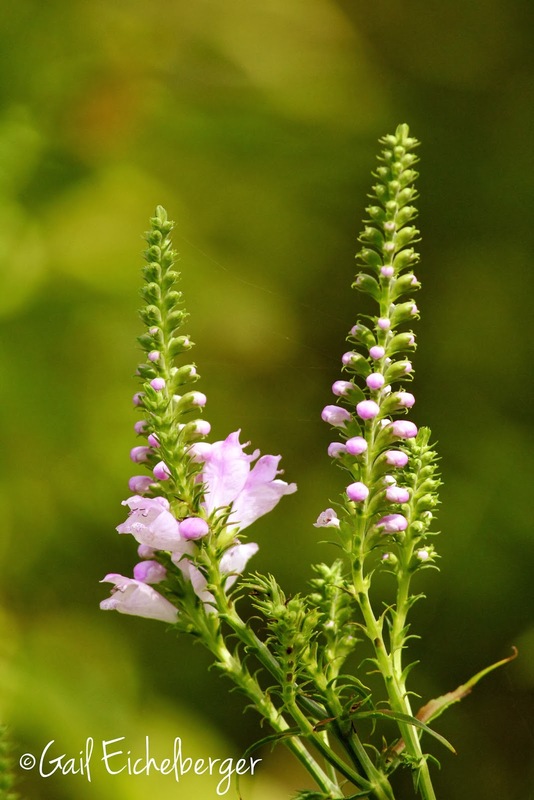 I love walking past my obedient plant in the fall and hearing it humming from all the bees inside the flowers. :o) It sounds like the plant is trying to sing. and thank you Gail for continuing to share all these lovely flowers and encouraging us all to think about what we plant. Hope you had a wonderful Christmas and best wishes to you in the year to come.